Welcome to Found Off The Street, our look at cars found on the cape that rust liked so much it decided to summer there; Cape Cod, MA. Today we have a 1969 Ford F100 Custom Cab. It is hard to argue with the fact ratty pickups are cool (if it isn't, it should be). Even cooler than your average ratty pickup are amazingly clean and original examples that show signs of regular street use like the 1967 Ford F100 Custom Cab seen here. No time was wasted taking pictures of this old Ford because it was clear the truck wouldn't be sitting around for too long. Ford introduced the fifth generation of their famed F-series truck in 1967. For the first three years, the design of the F series was almost identical, making it a little difficult to tell these trucks apart. The most noticeable difference between early fifth generation F series trucks is the changing grille design from year to year. 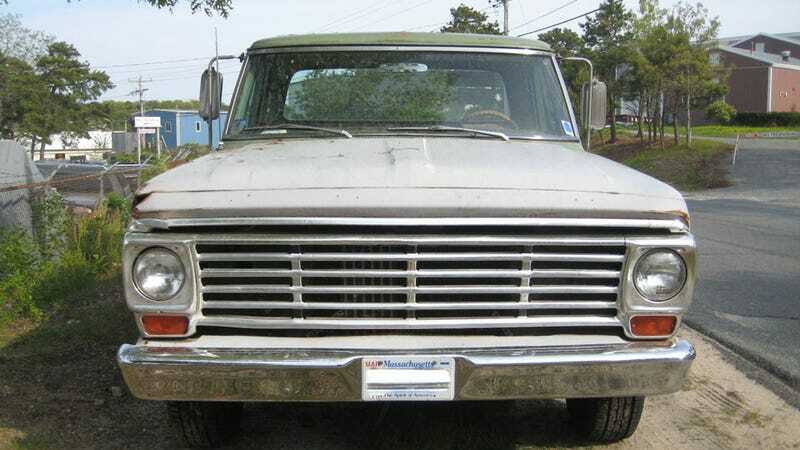 The truck you see in front of you is a 1967, or at least the grille is (I think). I was driving through a local industrial park last week when I came upon this cool old truck, not far from the FOTS Buick Invicta we saw a few months ago. Finding well used original vehicles like this is an increasingly rare occurrence in the Northeast where most 40+ year old vehicles are either garage queens or rotting lawn ornaments. While this old Ford's paint job show it's 44 years, the truck's body is amazingly straight and rust free. I feel pretty safe guessing this truck spent most of its life far away from the road salt and harsh winters of the Northeast or anywhere else. If someone took the trouble to bring such a clean example to the cape that rust remembered or purchase one once it got here I feel safe assuming the current owner that has every intention of keeping the truck straight and rust free. I hope this truck stays exactly how you see it for as long as possible. To me the beauty of this old Ford is how original and straight the truck is. When it is eventually painted this F100 will look more like another far too shiny Northeastern garage truck than the unique original truck you see here.